Nebraska Christian College a campus of Hope International University now serves as our institution of record. You may request your transcript from Nebraska Christian College's Registrar via their transcript request form. In order to request a copy of your Crossroads College or Minnesota Bible College transcript, a signed transcript request form is required by federal law. Please complete the Transcript Request Form completely. Missing information may delay your request. Official transcripts are only available by mail. Requests will not be processed until all financial obligations to the college have been satisfied. If you call and leave us a message, we will return it as soon as possible. We want to make sure you have marked your calendars for ourMay 17thVISION NIGHT. It will be a time of community building, question answering, and communicatingthe vision for HIU-MN. We view the Vision Night as a "Friends and Family" Gathering. It will be a little more casual, but the message and vision will be just as important. Come join us for a great night! Dr. Mark Krause from Nebraska Christian College will come and share some thoughts, Dr. Curtis McGinnis and Todd Looney will give you a behind the scenes look at the inner workings of the Minnesota Education Center, and our Keynote is Hall of Fame Speaker -Randall Munson. 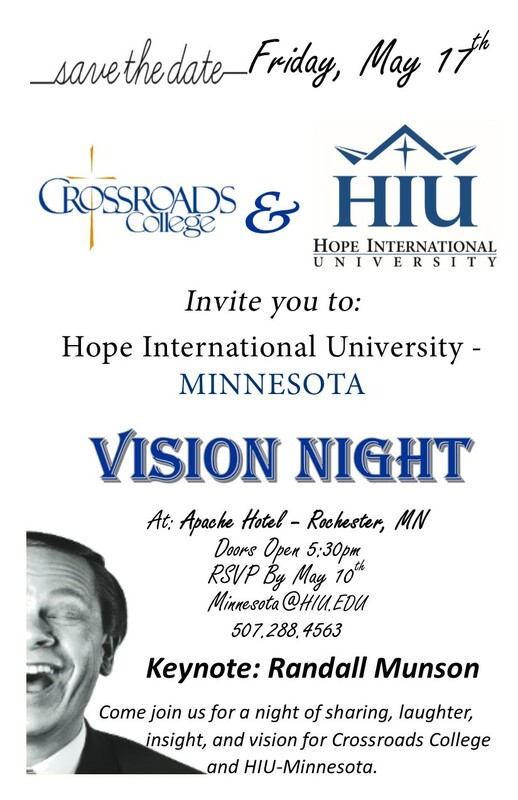 RSVP by emailing:MINNESOTA@HIU.EDUby May 10th.